The average 14-year-old doesn’t spend much time thinking abstractly or questioning the origin of life. But multi-disciplinary scientist and astrobiologist Dr. Bruce Damer wasn’t your average 14-year-old, and that question and many others circulated his thoughts while hiking through the Kamloops sagebrush in 1976. Damer’s thoughts and ideas continued to take shape and evolve, and led to him writing a series of articles for local newspapers. One of these was a science series where he shared plans for a new kind of spacecraft—one that would contribute to a significant leap forward years later in humanity’s quest to open space to human habitation. At 19, he proposed his plans to NASA with hopes of getting hired. They wrote back, which encouraged him to pursue a formal education and aim for NASA in the future. 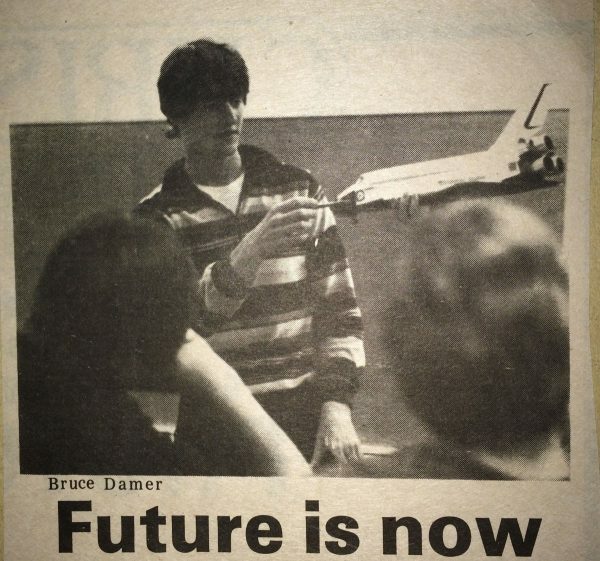 A 19-year-old Damer presenting his early ideas in Kamloops in the 1980s. In 1981, Damer enrolled in the nascent computing science program at TRU. Computers had always fascinated him, and inspired him to think about how the world’s issues could be solved by developing software and systems that could simulate scenarios to offer different outcomes, and find solutions faster. Damer credits retired TRU IT Services team member and fellow student Wes Cole, as well as faculty member Derek Chambers, as his inspiration and support for writing his first software programs. He continued developing his passion for computing in the mid-1980s as a University of Victoria co-op student performing leading-edge research for IBM. Later, he worked for a startup company called Elixir, where he developed some of the earliest PC user interfaces. In the 1990s, he led the community that brought the first multi-user virtual worlds to the Internet. Since 2000, he’s been supporting NASA and the space industry with numerous direction-setting simulations and mission designs. Damer’s most notable and recent research focuses on his co-authored hypothesis that the emergence of life occurred on land within fluctuating hot-spring pools, rather than deep in the ocean as previously thought. Many are calling it a paradigm shift in science as it changes the way we think about how biology first emerged, and suggests that other planets—such as Mars—might have possessed similar conditions that could support life. Damer currently serves on the NASA Mars 2020 team, where he contributes to deciding where to send the next rover searching for evidence of life on the red planet. He’s continuing his research with colleague Professor David Deamer, at University of California Santa Cruz. They conduct live-chemical testing in the lab and in the field at hot spring pools, in places like Yellowstone National Park in the United States and Rotorua, New Zealand. 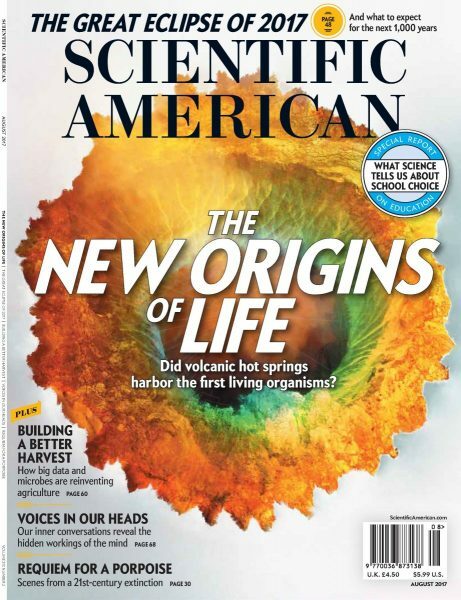 Recently their work was featured on the cover of Scientific American. Damer’s research has been profiled in Scientific American. “There will be many implications for humanity in scientific, philosophical and spiritual dimensions. The realization of our deepest ancestry will contain the psychological power to re-orient our civilization toward a sustainable, expansive and long-term future,” said Damer. He is principal scientist at the Biota Institute, a new research organization, an associate researcher in the department of Biomolecular Engineering at University of California Santa Cruz, an associate of the NASA Astrobiology Centre, treasurer of the International Society for the Study of the Origin of Life and founder of several companies in Silicon Valley. One of his companies is developing a new spacecraft that could harvest water, fuel and minerals from asteroids and help open a path to space for humans in this century. Another company is using origin-of-life science to develop a powerful new therapy fighting viral infections and head off the next global pandemic. Damer presents his potentially game-changing ideas at TRU’s Kamloops campus on Thursday, March 28, from 1–2 p.m., at a science speaker series event hosted by the Faculty of Science. This is a free event and open to the public. Damer is being awarded a Distinguished Alumni Award from TRU at an evening event on Friday, March 29.